Grado SR125e review | What Hi-Fi? When it comes to Grado, some things just don’t change. You have to take them for what they are. Many of our comments about the Grado SR125es will have been said before, and will be said again. You won’t buy them for their design, which is unashamedly idiosyncratic. They look like a headset for a 1950s shortwave radio, or the ‘ears’ on a Cyberman. The SR125es are sturdier than they appear on first inspection, with swivelling ear cups and detachable foam-pads attached to a thin band of faux-leather, courtesy of short metal rods that stick out like antennae. You won’t buy the SR125es for their noise isolation. Indeed, Grado seem to design their headphones with the very opposite in mind. These are about as open as open-backed headphones can be. It’s possible to hear what anybody says within six feet of you, and they’ll hear every note you listen to, too. 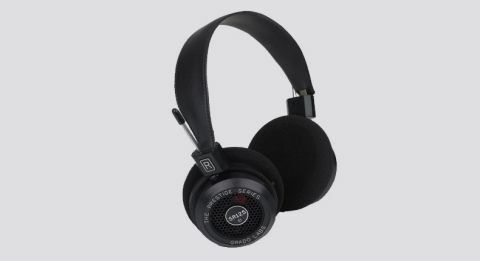 Don’t wear these on a bus; the Grados are supposed to be experienced at home, on your lonesome. Why? Because the sound is astonishingly good. They’re awesomely detailed, with impressive variation in texture. The open back affords them plenty of space, and so the soundstage is as wide as you like. It’s a balanced sound: sparkly at the top, with an expressive midrange, and plenty punchy at the bottom. Agility is another strong point. These Grados pound along with pace and relentless energy, and it’s hard not to be entertained. Put it together and you have a wonderfully capable performance for the money, with detail, precision and endless musicality. Sure, they won’t win any beauty contests and they’ll grate with anybody within earshot - but they’re certainly good enough to warrant buying for the home.